Can WWI be a wargame? On 1st July 1916, the Newfoundland Regiment, part of the second wave of assault, crossed from the second line of trenches, in the foreground of the picture, to the first line, which you can see in the middle distance, over the top because the communication trenches were clogged with wounded from the first wave attack. They did so under fire from the German positions, in front of the main line of trees, and suffered heavy casualties. They then went over the the top again to attack the German positions. They only got as far the small group of trees you can see between the positions. They suffered 85% casualties from their 780 men, including all the officers: the highest ratio of a dreadful day. Last week I went with my wife and a friend on a battlefield tour of the Western Front to WW1, conducted by Tim Wright (his company is Lost Generation – and I can heartily recommend, including the bed and breakfast managed by Tim’s wife Gill). The scale of the loss of life is completely breathtaking, and made so visible in the graveyards and memorials. Moving as that was, I am also a wargamer with an interest in military history. The experience made me reflect on the nature of the war, and how it compares with what came before and after. And always the question: how do you wargame it? And as this is wargaming blog, it is these reflections that I am going to concentrate on in this post. WW1 (1914-1918) forms one of the two main links between the two periods that I have been studying in particular: the Napoleonic Wars (1793-1815) and WW2 (1939-1945). The other link are the wars fought in Europe and America in the 1860s or thereabouts – which I am also taking a growing interest in. What struck me on this tour was the similarity between WW1 and the Napoleonic era in one special respect: the compactness of the battlefields. The British Somme theatre was a matter of a dozen kilometres; this compares with the larger Napoleonic battlefields, and the density of men to frontage occupied wasn’t much less. The gap between the two sides at the art of the battle was if anything even closer than in Napoleon’s time, as the picture shows. WW1 battlefields were deeper though – as artillery ranges were so much longer, and the artillery lines were a few kilometres back from the front. This is in contrast to WW2, where the densities were quite low, and a large part of the task of field commanders was finding out where the enemy was. Reconnaissance forces played a critical role, and patrolling became an important task for most troops, instead of being reserved for specialist forces like light cavalry. In WW1 troops had to stay under cover for as much time as possible, or suffer devastating casualties from artillery – but you would hardly describe the battlefields as “empty” in the way of WW2 ones. A second observation from the tour was how terrain dominated the fighting. The ground around the Somme could not truly be described as hilly, but it definitely rolls. In England the closest comparison is probably Salisbury Plain (where my father lives, and which I have just returned from) – which is where the British forces trained. There is quite significant relief, fairly frequent villages and farms and lots of woods; the field boundaries are minimal (unlike the Wiltshire countryside off the Plain); there are hollow roads and ravines that can provide important cover. One point of interest is how well the Germans selected their ground; that takes a good eye, since the differences between the strong and not so strong positions are often quite subtle. As they were retreating from the Marne, they did have the luxury of choosing the ground – but our guide Tim wonders whether they had developed ideas on this before the campaign was even opened – a Plan B. Moving north from the Albert region, the northern Somme valley, where the British fought, to Arras and Ypres, the main other regions of the fighting for the Commonwealth troops, the ground flattens out considerably – it becomes more like East Anglia or Lincolnshire in British terms. But there is still relief, and the same principles apply. The hardest fighting was over positions which offered better visibility, such as Vimy Ridge near Arras, and Passchendaele near Ypres. This is something WW1 shares with earlier and later periods. There is an obvious reason for this in WW1 and WW2 – the provision of positions for observe and direct artillery fire. But it is more than that. It matters for shorter range weapons too, like machine guns – or smoothbore artillery come to that. And there is the psychological effect of being able to seem more or less; this was very apparent from our walking of the fields. We might add that soldiers before the era of motorised transport (and often after) tended to be heavily-laden. Walking up slopes takes its physical toll (a fact mentioned by the French at Bussaco, for example – the slope was steep but distance quite short). Wargamers struggle to do the effects of relief justice, though. It is often very hard to represent accurately on a tabletop, never mind reflecting it in the rules. 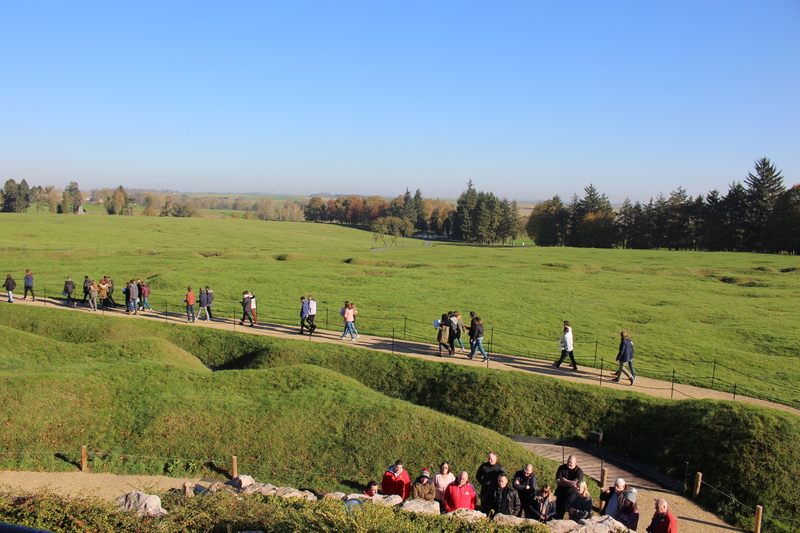 The ground around Ypres shows that even subtle slopes can matter a lot. My third big observation from our tour is the issue of command and control. WW1 is an important moment of transition. Before then men and junior officers were supposed to follow orders to the letter regardless of how stupid they looked. Relatively few men were allowed, and mentally equipped, to take big command decisions. In the 18th Century, when armies coordinated through forming great battle lines, this mattered little. In the Napoleonic era there became a pressing need to articulate armies with corps and divisional levels of command, and also to develop greater tactical initiative in light troops. But by the start of WW1 things seem to have moved on little. At the Somme this took the form of detailed plans of attack, which were supposed to be followed regardless of local glitches (like not having knocked out the enemy machine gun posts). The men were not briefed at all; which was a problem given the rate at which officers became casualties. The Somme showed how disastrous this approach was, and new methods were developed – and not just by the British; the Germans had their own problems, even though their thinking was already ahead. Clearly there were similar issues in the French army too, from some of the fictional dramas I have seen – though I know a lot less about them. It became crucial that battalion, company and even platoon commanders could take decisions based on what the enemy actually was and what he was doing. And so what does all this all mean for wargaming? The main lesson that I took away was not even to try. WW2 is hard enough, but at least you can create interesting skirmish games which are not so unrepresentative of the fighting, since the troops were so dispersed. But it is very hard to see how you get a decent game out WW1 battles – at least on the Western Front in 1915-1917. The openness of warfare on other fronts and at the beginning or the end of the war may offer fewer problems, and offer a clearer idea of what the point of a game is. One of the issues with the type of fighting in these mid-war battles is working out who won; people still argue over it. So much of it was about the relative expenditure of resources. That is not a promising basis for a game. I have already taken on too much with WW2; I will not be tempted into WW1, even though the era has its own very special fascination.